This was an easy day of travel and every train and connection went exactly as planned, almost to the minute. We were a little concerned because the hotel in Santiago which we booked and prepaid only accepts check-ins up to 9:00pm and our train wouldn't arrive in Santiago until 9:51pm. After a few emails the hotel agreed to have someone wait for us until 10:00pm. Talk about cutting it close. The train arrived exactly on schedule, we raced to the taxi (as fast as one can race carrying a heavy backpack) and told the driver we had eight minutes to get to our hotel before the reception desk closed. We made it. Not so sure about some of the meandering pedestrians. We got to the hotel at 10:00pm on the dot. By 10:20pm we had left our bags in our hotel room and were out looking for a pintxo bar. Pintxos are obnoxious carnivorous concoctions which Dayton loves; in his mind the more bizarre the combination the better, and I humor him because he does carry my sleeping bag, poncho, toiletries and the chargers and sometimes even my wine. 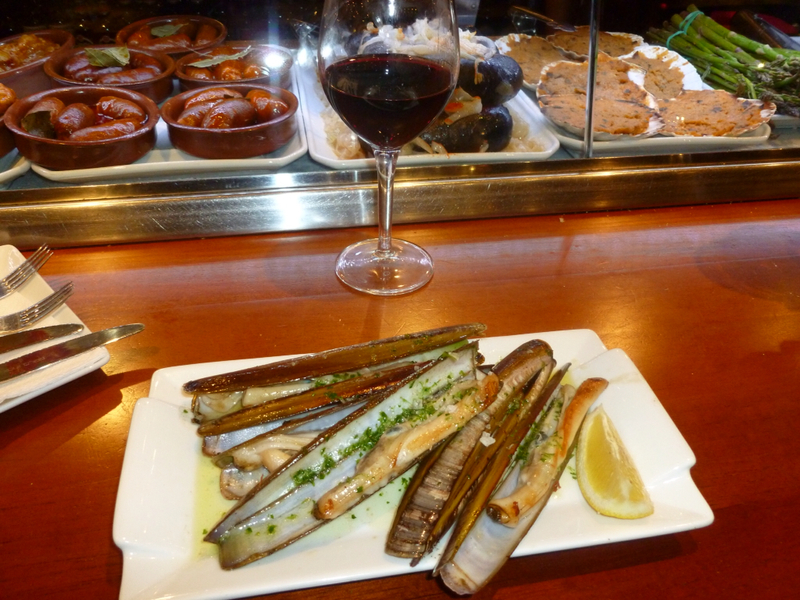 We found an excellent pintxo bar and over indulged. Dayton's favourite this time was a plate of grilled razor clams. I think he will be having a second serving for lunch tomorrow. We both commented on the fact that we have never been out this late on a Camino yet. Ha, we're rarely out this late ever. After the pintxos, we walked up to the elaborately magnificent Cathedral. The Cathedral was lit up highlighting the ornate detail of all the many spires. 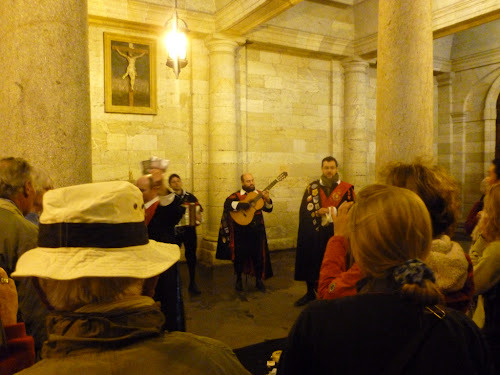 There were muscicians in local costumes playing for an audience of pilgrims and tourists, some of whom were creating their own folk dances to go with the music. Two minutes later and we were back to our hotel which is about 50 metres from the cathedral; ideal location. 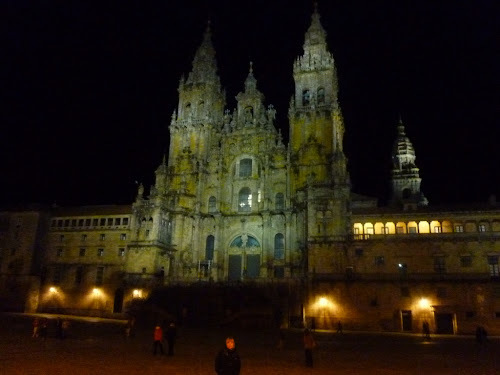 Tomorrow we have nothing to do but tour Santiago and organize our Camino Muxia which we will begin walking on Tuesday. I think each stage of the Muxia walk is at least 30kms so I'm hoping to pre book accommodation. I don't want to walk 33kms and discover there are no rooms at the inn and we have to keep on walking. Dayton also wants to do the cathedral rooftop tour and maybe we'll go up to see the new Camino exhibit museum and, of course, there will be more pintxos. Dayton also intends to attend every Mass at the Cathedral until we see the bonifeira (sp) incense burner swinging. Nothing like cutting it close. So glad you made it on time. Reading your blog we are suffering Camino separation anxiety (challenging weather notwithstanding). The razor clams look terrific. Enjoy your break in Santiago and have a great walk out to Muxia.